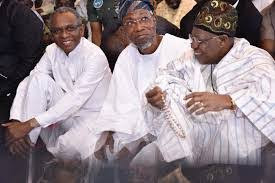 The Peoples Democratic Party (PDP) says nine All Progressives Congress (APC) governors have invaded Osun state to rig this Saturday governorship election in favor of the APC. The party said, “We wish to bring to the notice of Nigerians that Osun State has again been invaded by nine APC governors who continue to remain the arrow head and catalyst of its rigging machines across the nation." Ayo Fadaka, south west zonal publicity secretary of the party, said this in a statement on Friday. He accused the governors of causing disquiet in the state, saying this development is capable of leading to unforeseen developments. PDP said, “They brought into Osun State public funds meant for the development of their individual States to come and buy votes again as done recently in Ekiti State, accompanying them are thugs whose only mission is to cause mayhem in the State during the elections. “These Governors are led by Alhaji Ganduje and Mr El’Rufai of Kaduna and there nine of them presently on ground. It is sad that the APC continues to pride itself in this malfeasance of wholesale bribery in spite of its so called battle against corruption.